Sprawling lawns, eternally leafy trees and hordes of wide-eyed freshman are not the only things “green” on campus these days. Increasing efforts to make Biola a leader in the stewardship of God’s creation have landed the university on a list of the “greenest” colleges in the United States and Canada. 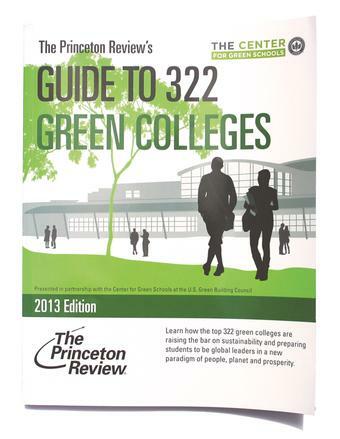 Biola is one of the 322 “most environmentally responsible” colleges featured in The Princeton Review’s newly released “Guide to 322 Green Colleges: 2013 Edition.” Published on April 16 in advance of Earth Day, the guide recognizes Biola as a university that has “demonstrated a notable commitment to sustainability” through initiatives ranging from commuter and carpool incentives to vegetarian dining options and an environmental science major. “Biola is accelerating toward a highly sustainable university life, with both students and administration participating in securing a green future for the campus,” according to the guide’s profile of Biola’s green efforts. In selecting Biola, the organization took note of the university’s commitment to clean power through its cogeneration plant, recycling stations, and WeCar and shuttle service options to minimize single-driver transportation. The guide also mentioned Biola’s student-run environmental club and Creation Stewardship Committee, which reviews and assesses environmental measures on campus and makes recommendations to the administration. The Princeton Review selected schools for the guide based on a 50-question survey conducted in 2012 of administrators at hundreds of four-year colleges and universities. The organization analyzed data about course offerings, campus infrastructure, activities and career preparation to measure schools’ commitment to the environment and sustainability. Biola was the only evangelical university in California to be included on the list. The 215-page guide is the only free comprehensive resource of its kind. Featuring a variety of data on each profiled school’s sustainability initiatives, the guide can be downloaded at www.princetonreview.com/green-guide. Watch Biola’s “Ask the Experts: Energy and the Environment” video series (including the clip featured below) on open.biola.edu and read Biola Magazine’s Fall 2008 article “The Greening of Evangelicals." Fifty years after the author's death, why has "the next Lewis" remained so elusive?